Jahangeer Majazi was born and brought up at Hajin; a famous place for literary and cultural activities in Jammu & Kashmir's Bandipora district. 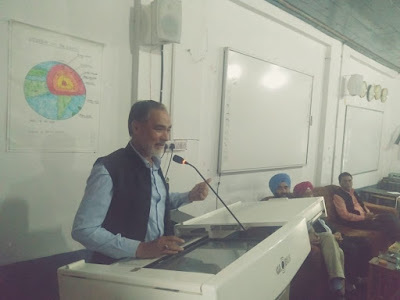 After obtaining his Bachelor’s and Master’s degrees in Psychology, he now pursues his Ph.D programme in Psychology from Aligarh Muslim University. Jahangeer has contributed his articles and poems to various newspapers. The author draws his inspiration from khalil Gibran and Maulana Rumi. 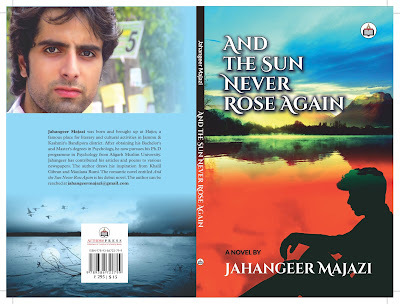 The romantic novel entitled “And the Sun Never Rose Again” is his debut novel. Mujahid: Jahangeer, please let us know about your personal life a little bit. Jahangeer: I was born and brought up at Hajin. Hajin is a famous place for literary and cultural activities in Jammu & Kashmir's Bandipora district. After obtaining my Bachelor’s and Master’s degrees in Psychology, I am pursuing Ph.D from Aligarh Muslim University. Mujahid: You are a student of psychology, then how did you venture in art? Especially in novel writing? Jahangeer: I wrote this book, not because I had to, rather because I wanted to. I wrote because writing helped me overcome myself and dig out the best from the worst. I wrote because I enjoyed writing. And I wrote this book for myself only. It was my obsession to become a writer and studying psychology helped me write a unique and a better story. Mujahid: What made you write a novel? What exactly makes a writer write? Is it pain or romance or frustration or something else? Jahangeer: Life made me write. Making friends and learning about their tragedies and other horrible experiences about life in general inspired me to write. My father, Majeed Majazi, who is a teacher by profession and writer by passion, guided me throughout. There was a phase in my life when I had a huge amount of dark energies inside and writing helped me transform that energy into this novel. Different writers have different reasons to write but if the writer has lived the story himself/herself, He/she would be more successful in conveying his/her message. Mujahid: When did you start writing “And the Sun Never Rose Again”? How much time it took you to complete it? 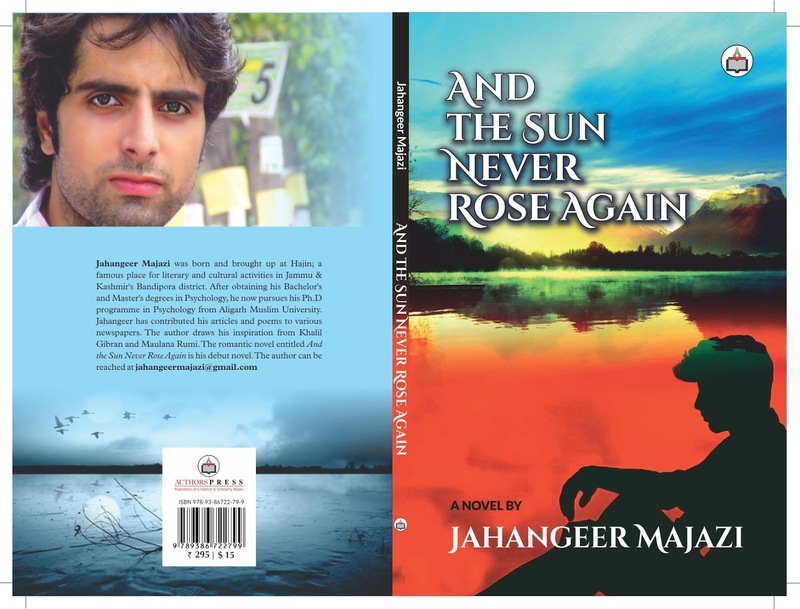 Jahangeer: I was 19 years of age when I began writing this novel. And it took me around six years to complete it. At times, while writing, I would feel so motiveless to continue but the expectations of my family and my friends would always strengthen up my mind and help me continue punching the keyboard. Mujahid: What “And the Sun Never Rose Again” is about? Are the characters from Kashmir only? Jahangeer: The novel tells a sad love-story of Zaid, a schizophrenic lover, and Zohra, an orthodox Muslim girl. They fall in love with each other and spend some good times together, love each other intensely and passionately and create some lasting memories but then suddenly unthinkable happens. Yes. The characters are from Kashmir only. Mujahid: How did AMU contribute to your writing? Jahangeer: The long journey of eight years in Aligarh Muslim University helped me a lot in reaching my set target. I wrote the entire novel in Maulana Azad library. There were the days when I would write around fifteen hundred words a day but there were also the days when I would end up writing five to ten words only. Meeting people here and making so many friends taught me that everyone has a story that can be transformed into a good book. This novel is the story of those people who have lived an unfortunate love life. In my life I have met so many people who equally contributed to the birth of Zaid and Zohra on my mind. Mujahid: How has the conflict in Jammu and Kashmir influenced you and your writings? Jahangeer: Had I not talked about the Kashmir conflict in this novel, the novel would have been incomplete. Though there are very few lines about the conflict but I think that still narrates a lot. Mujahid: Jahangeer, we are thankful to you for taking time for us. We at Pir Panjal Post wish you all the best.